First of all, Happy new year filled with cool guitar tones! The Soul Food from Electro-Harmonix continues to intrigue, the sub 100 dollars Klon Centaur clone has been attracting a lot of attention. I have featured a number of expensive and less expensive Tube Screamer alternatives over the past year and I thought the Bad Monkey’s turn was long overdue. 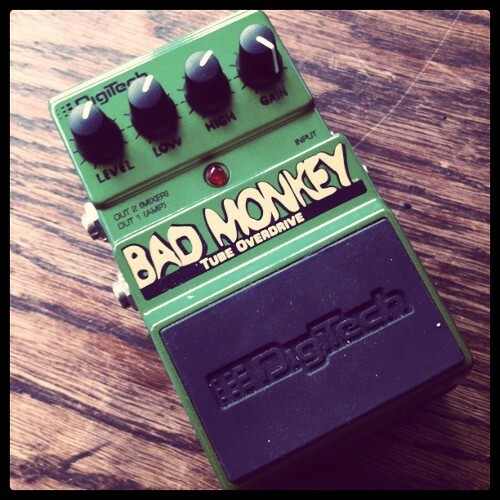 It is not really a secret: the Digitech Bad Monkey is an excellent overdrive used by a number of pros, check out Phil X’s videos and you will hear it in action quite often. As always, I have recorded two videos showing the Bad Monkey in action (see below). They will show how you the beast fares with Single Coil pickups as well as Humbuckers, acting as main overdrive against a clean amp, or as a boost against a distortion pedal. But before watching the videos, let’s introduce the Bad Monkey. It is a green pedal featuring one input and two outputs. It is not stereo though: one output features the unfiltered sound of the overdrive while the second one features an emulated speaker cabinet output so that you can plug the pedal directly into a mixing desk or a sound interface. It is actually a common feature on Digitech pedals and you can hear a quick demo of the MIXER output after the videos, at the end of this post. Clearly inspired by the Ibanez Tube Screamer in terms of overall tone, the Bad Monkey features a Gain and a Level setting. But it also features something that most overdrive or distortion pedals desperately need: a 2-band EQ. Instead of the measly Tone control often found on other pedals, the Bad Monkey allows you to tune the Bass and the Treble frequency of your tone. This is a big plus and the only overdrive pedals to feature an effective EQ (that I know of) are the Xotic models such as the BB Preamp. 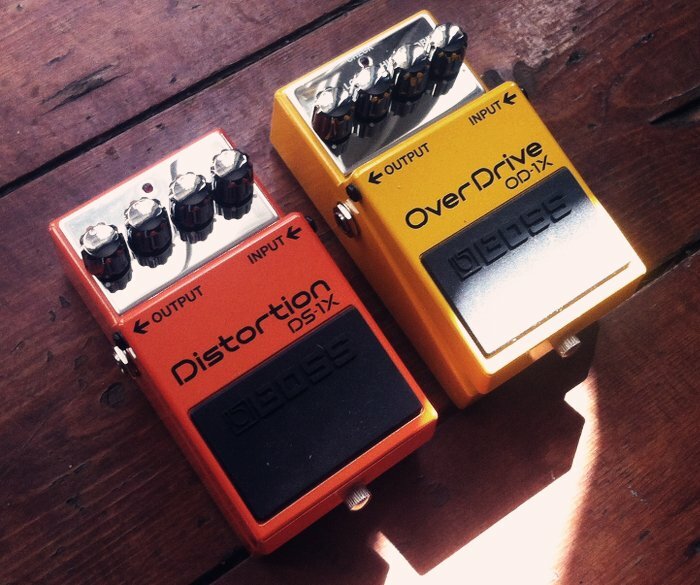 Note that for these two videos, I had a Boss RV-3 plugged after the overdrive pedals. It was set on a short Room Reverb (mode Room 2). The amp was my trusty 74 Fender Champ miked by a RODE NT-4. I could not resist and tried the Bad Monkey directly plugged into my Boss Micro-BR. Pretty bad!! That is what you get when you plug a distortion/overdrive directly into a board. It is actually not bad at all, I was pretty surprised in a sense that it is usable although a bit dark sounding, but it is definitely not just a gadget. It sounds quite good with the gain on minimum as well, it gets you a usable Jazz/Blues type of tone. The Digitech Bad Monkey is a great alternative to a Tube Screamer. Actually, more than an alternative, I think it can complement a Tube Screamer really well. I don’t think it sounds quite as smooth as my Analogman TS9 but the 2-Band EQ and the Mixer output makes it really versatile. It is also excellent used as a booster. The best thing is its price, just check it out! The setup is 1978 Telecaster, bridge pickup -> Boss SD-1 with Tone at zero, Drive at 2 o’clock, Level at 3 o’clock -> Analogman TS9 with Drive at 3 o’clock, Tone at 9 o’clock, Level at noon -> 1974 Fender Champ set clean. A zest of compression and plate reverb were added in Cubase, and here you are: a nitty gritty dirty rock tone full of sustain, Telecaster style, coming out of a very small amp. For those of you having a “squealing” problem with the bridge pickup of your Telecaster while using a lot of gain, I advise you to have the pickup wax potted by a professional. It did wonders to my Telly. For those of you interested in fattening their Strat or Tele tone, don’t forget the Pro Co RAT 2.